This article takes a closer look at what those colors mean and how they are applied. It is important to highlight that the information below only covers beacons for road side use. Selection of strobe and light colors for marine and airport locations differ with the recommendations provided in this article. •	Blue: Blue is usually reserved for official use, such as by law enforcement, fire fighters, ambulance services and more. In numerous jurisdictions across the US, this beacon color is not used by civilians – though this does not mean the purchase of beacons with blue lights is prohibited. Buildings that are near roads can still use blue lights on fences, poles and etc. As regulations surrounding the use of official strobe colors is governed by local laws, it is important to first check how they are applied in your area before using this color. •	Amber (Yellow): This color is one of the most widely used variant on public roads. 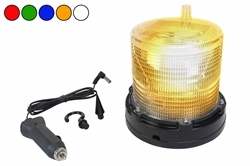 Road repair and maintenance projects use this type of beacon to warn drivers of obstructions and ongoing work. Tow trucks also rely on amber strobe lights to notify other vehicles about their presence on the shoulder, when attending to customers. Compared to blue, amber does not have any official guidelines that restrict its usage. However, since yellow strobe lights are typically associated with general roadside notifications related to construction, hazards, road obstruction, signs, toll gates and towing, it is recommended that they be used in similar manners to avoid confusion. •	Red: Like blue, red beacons are reserved for fire fighters, police departments and emergency services (ambulances). In some locations, there are restrictions surrounding the use of red flashing or rotating strobe lights. This type of luminary may also be deployed in extreme hazard or risk scenarios that go beyond the general hazards and applications of amber beacons. •	Green: Green is infrequently used for road side lighting. This color is used to highlight the presence of a command vehicle, such as a mobile command unit managed by a fire chief. Additionally, green strobes, in some locations, are used to guide funeral vehicles. The color signals general safety and security. •	White: White is an ordinary color of choice for road side beacons. It may be applied as a secondary light color, flashing with a primary color. As a general purpose light for strobes, it has very little to no restrictions. In some locations, this type of beacon is required on school buses and mass transportation units. Railroad establishments may also use white or clear strobes to enhance visual notification. It is important to emphasize that red and blue beacons are largely prohibited for mainstream, civilian-related applications. Moreover, the brightness of the strobe light, in some jurisdictions, must adhere to local guidelines. The general brightness limit for strobing units is 300 candles. This restriction was set to ensure mainstream beacons don’t compete with road side lights for official use. Businesses that use caution vehicles often rely on white beacons to notify others about their presence. This includes utility workers, storm chasers and more. The use of white strobes does not give such vehicles the right of way on public roads. They must still obey local road and traffic laws, when in transit to a destination. However, there are some exceptions to this application. A utility service vehicle that is working on a sidewalk light and is taking up space on the road may flash a white beacon to prevent accidents. In such cases, drivers must prioritize the presence of the utility operator.